Nancy Hoyt has a comprehensive, diverse professional career in government and private industry including clinical and administrative healthcare, infection prevention, epidemiology, IT data management and software engineering, strategic geographic surveillance cartography, the fashion and textile industries, and has owned or owns multiple businesses including brick-and-mortar retail, e-commerce, is the president and CEO of Kiyo Design Inc., and is a published author in multiple medical and nursing textbooks, journal articles, and medical research projects. Some specific information about Nancy's education, certification, and professional experience is here. Nancy Hoyt is a 7th generation Marylander, great granddaughter and granddaughter of Chesapeake Bay watermen and shipwrights, daughter of an Anne Arundel County physician, grew up and lives in Severna Park in Maryland Congressional District 4, is the widow of Cory Kiyoshi Hamasaki following their 27 year marriage, mother of 3 grown daughters, and grandmother of 2 granddaughters. Since 2002, she has supported multiple campaigns and activities of Republican elected officials, candidates and Republican clubs, and has stepped up to the plate to run for Congress in Maryland District 4. 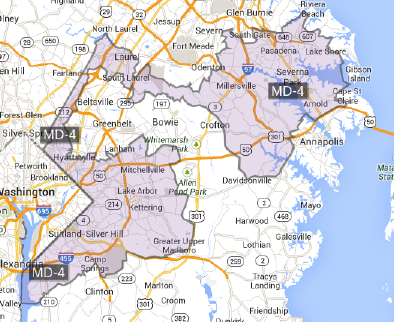 Maryland Congressional District 4 includes the center of Anne Arundel County and the top and western perimeter and western interior of Prince George's County.